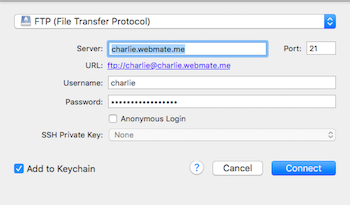 Use your FTP details to publish your website and cloud files on your WebMate. To publish to, or to view the files on your WebMate you will need a program called Cyberduck (It’s Free!) and you will need your FTP details supplied by MacAce. Open Cyberduck then click Open Connection then enter the details listed below. From here you can download files by dragging and dropping to your desktop or a specified folder. You can also upload your files in the same way.